A printmaker especially known for subtle tonal variations in aquatints, Charles Capps, whose friends called him “Chili”, did many images of Midwestern scenes and Southwestern subjects as well as commercial art endeavors. He was especially taken with the adobe architecture of Taos and Santa Fe. He created his own plates, and turning out editions of about 100, signed and numbered each one in pencil. 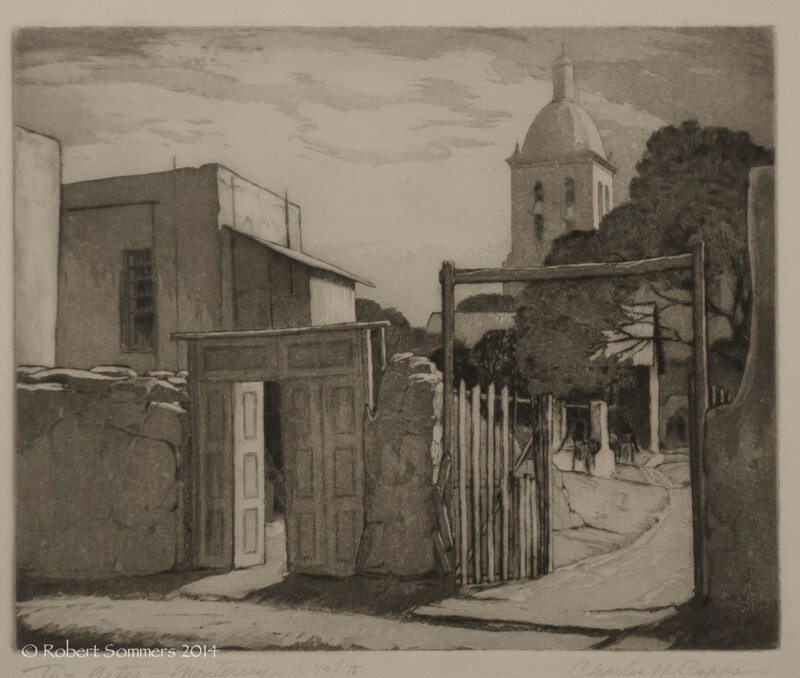 In total, he completed about 80 prints, of which half are aquatints, a third etchings and drypoints and the others blockprints and lithographs. An active member of the Prairie Print Makers of Kansas, he served as its President for twenty-three years. He was also active in the Society of American Etchers, the Chicago Society of Etchers, Philadelphia Society of Etchers, Northwest Printmakers and Printmakers Society of California. Capps was born in Jacksonville, Illinois where his father was a clothing manufacturer, and Capps worked in the mills during summer vacations. He went to Illionois College in Jacksonville, graduating in 1920 and then attended the Chicago Academy of Fine Arts and the Pennsylvania Academy of Fine Arts in Philadelphia. Returning to Jacksonville, he married Anna Palmer and the couple moved to Wichita to work for Western Lithograph. Shortly after, he returned to Illinois, taking an advertising job in Springfield. Then they moved to San Francisco, where he worked as a free-lance advertising artist until 1925, when he returned to Wichita and a promotion at Western Lithograph. Soon he began experimenting with woodcuts, creating a series of award-winning bookplates, and from 1931, did etchings. The quality of his prints earned him membership in professional printmakers’ organizations including the Chicago Society of Etchers, where the committee upon seeing his work, burst into applause. Also friendship and classes with Doel Reed, professor of art at Oklahoma State University, and master of aquatints, had a profound effect on Capps’ career, which was memorialized just before his death with a joint retrospective with Clarence Hotvedt and Lloyd Foltz sponsored by the Wichita Art Association. Capps died July 17, 1981.